It seems as if now-a-days when someone mentions Information Security, the first things that might come to mind are the dreaded words: APT, China, and Cyber War. But there is much more to it I think. The government is definitely on the cyber war kick. With nation states actively sponsoring attackers, and defense contractors locking up their IP tighter than the great firewall of China, who could blame them? I mean viruses and other malware just jump through the air now and land on systems that are supposed to be off the grid! Its madness!!! The apocalypse is not coming on December 21st, it is already here! So while all the big boys fight it out with their budgets and search for the newest best shiny toy or magic unicorn slaying bullets, what are the little guys doing? Who is protecting them? 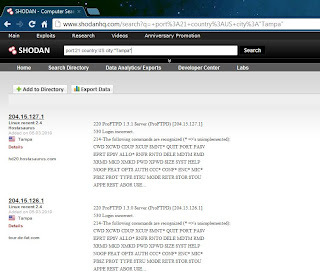 Over the weekend I was messing around with Shodan (http://www.shodanhq.com). For those that don't know, this is basically a search engine to find online devices such as routers, webcams, VoIP phones, Power plants, and Wind Turbines... wait what? Yep, you know those important systems that feed our electrical grid and people are always concerned with being attacked? But that is a discussion for another time. So back to this awesome tool and its many uses... Now one might ask, "How can something like this be allowed to exist???" Well that is easy, the data it searches is publicly available on the Internet. It searches based on any number of criteria such as open ports, website headers as well as response banners. You can also drill down to specific locations. 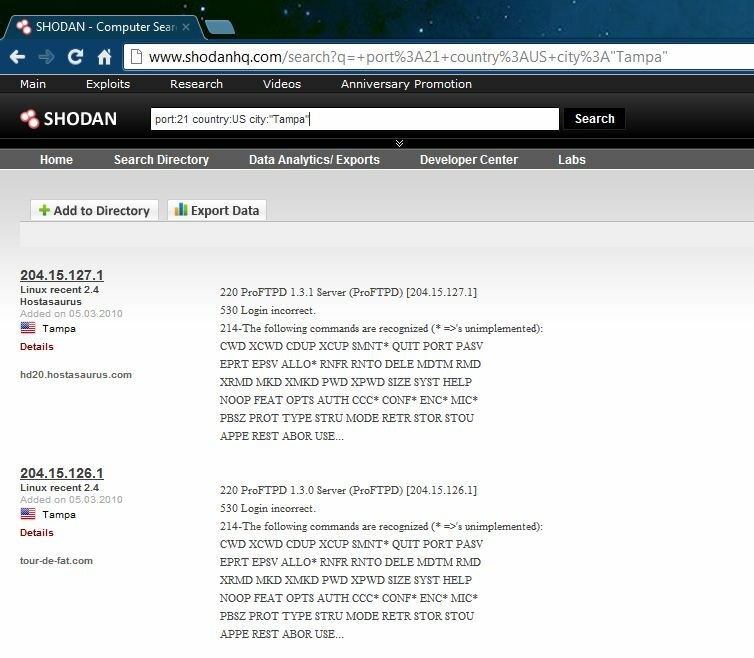 For example you can search for open FTP ports in your home town. Now I am not from Tampa, but I didn't want to out my own town. So as I was popping in different ports to search on, I stumbled across a list of open RDP (remote desktop protocol) ports. Of course my curiosity gets the better of me and I find one device is a Windows XP system that could possibly be linked to say a financial department at a local University. I was like oh fudge (only I didn't say fudge)! I had no luck with my other University contacts, so I am now tasked with the next steps: Do I track someone down at the school and say "um... you dropped something here" and show the them site and query? Or do I say screw them and their crappy security and move on? The enterprising youngster in me say, "hmmm could be a nice lead." But the paranoid adult in me says "Hell no they will probably think you are hacking their network!" So what do you think? Leave your comments below! Sent the "Data Security Admin" an anonymous email stating the problem and heard nothing. Oh well I tried. On to the next task.